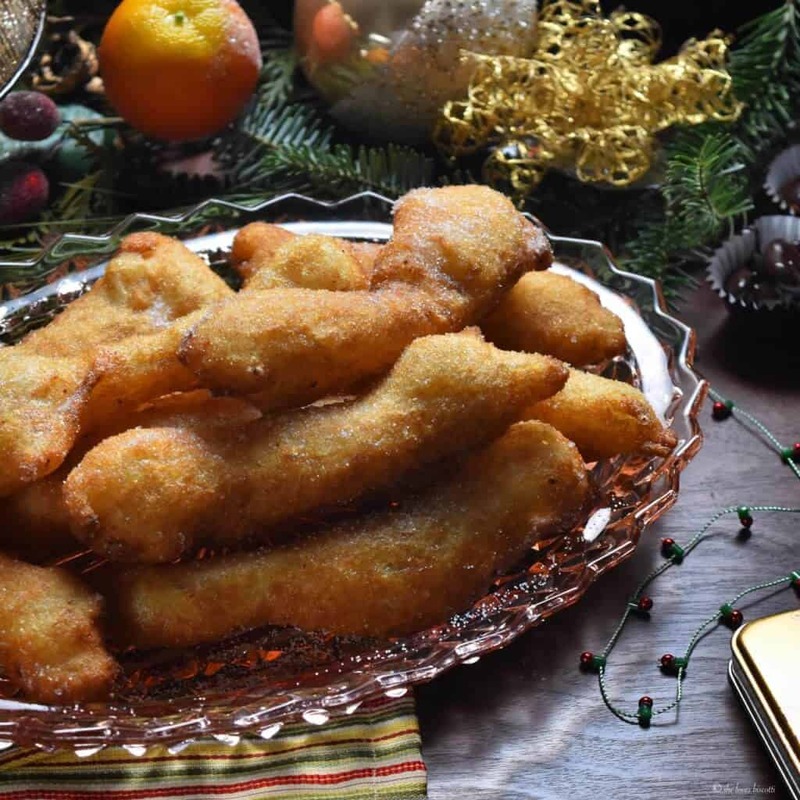 Whether referred to as screppelle or Italian donuts, one this is for sure, this family recipe for these Traditional Molisani Christmas Eve Fritters is simply amazing. I would like to share one of my fondest food memories I have of growing up Italian and it takes the shape of a yeast donut made with potatoes. I said time and again that I try to avoid fried foods whenever possible; usually I will try to replace frying with baking. Being of Italian origin, there are a few exceptions to my “no fry” rule and it usually occurs around Christmas time. One of these fried Italian cookies we love is Struffoli. You have probably heard of these being referred to as Italian Honey Balls. This is a no yeast dough that is formed into little balls and then deep fried for just a few minutes. As they are frying, they puff up to become light and crispy. They are then drenched in honey. Another exception to my “no fry” rule are known as Crostoli. This is another no yeast dough that is rolled out paper thin and then fried. It literally takes just a few seconds for the dough to puff up. These fritters are then dusted with icing sugar. You have never tasted such a light and flaky dough! Today, the focus will be on another one of my exceptions which I refer to as Screppelle, which are basically Italian donuts. Growing up Italian meant so many things to me, and one of the best things about my Italian family was all the get-togethers during the holidays. 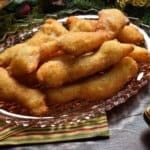 In preparation for Christmas, my mom and nonna would make these delicious screppelle. They are great when they are fresh, but don’t keep especially well, so there was always a mad-rush on Christmas Eve morning, trying to get everything done. I cannot even begin to describe how delicious these fritters are right when they cool down. The first bite you take has them being still warm and all rolled around in granulated sugar… yum! The whole process begins with some magical yeast. Proof the yeast according to the packet directions. Then, mix all the ingredients together: the yeast, flour, salt, and – wait for it! – the boiled/mashed potatoes. Yes, potatoes! It may seem weird, but trust me on this one. 🙂 You’ll need some warm water for this recipe, too – I provide an amount in the recipe below, but really, you only need as much water as “is needed”, cryptic as that sounds. 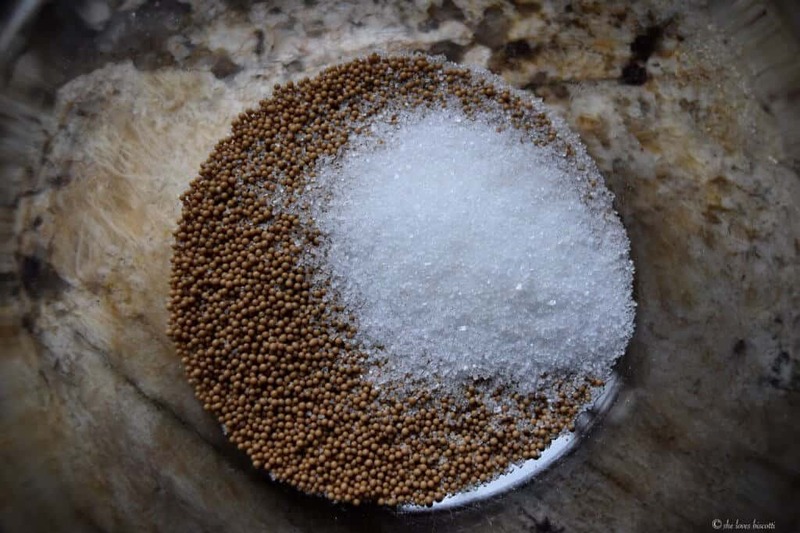 My mom and grandma never actually measured out ingredients, but instead gained so much experience in making certain recipes over and over again that they would add ingredients “by eye”… they knew what consistency they wanted the dough to be, in the end, and added ingredients until it reached that consistency. Even I don’t have enough experience to make these without measurements though – it takes years of practice! Anyway, the resultant dough should be smooth, elastic and sticky. Don’t even try to shape it into a ball. Just cover and let it rise for a couple of hours or until double in size. Once the dough is ready, it will soon need to be deep-fried, so start heating up your oil. Nowadays, most Italians (that I know) will use all-purpose vegetable oil for this recipe, but some say that that leaves a bit of an aftertaste. You can use canola oil, or peanut oil, if you’d like to avoid that. You should also prepare a large plate, lined with paper towels – you’ll need it later. Stretch the dough out in your hands, and drop it carefully in the oil. Be careful not to splash! Do this for 3 or so pieces of dough. The dough should float in the oil. Then, with two forks, one in each hand, turn the fritters over and over again while they are in the oil, so that they fry evenly. When they achieve a light golden color, remove them from the oil, and place on the plate lined with paper towels. Repeat until there is no dough left, but don’t forget to thoroughly coat the fritters in granulated sugar while they are still somewhat warm! My mom used to toss them with sugar, but I prefer sprinkling them with sugar. Time is of the essence with this recipe, so I find it most efficient to do this with two people. 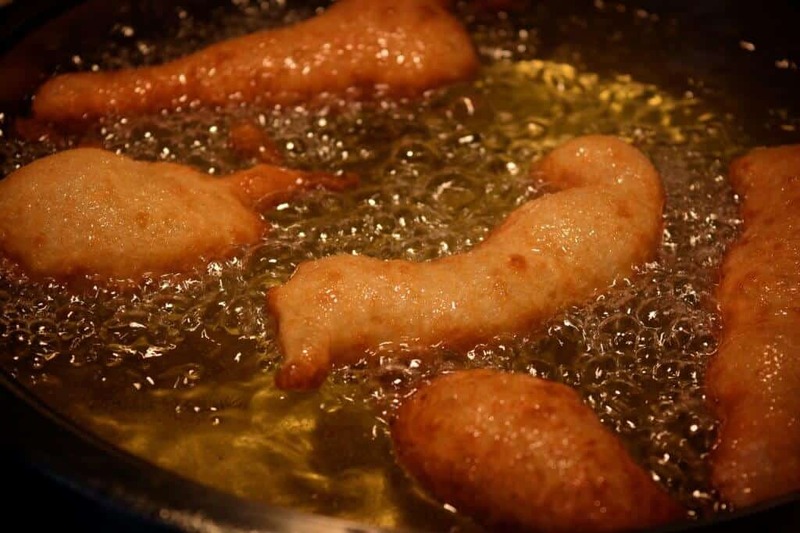 One person scoops out and shapes the fritters, and drops them into the oil; the other person turns the fritters constantly, and sprinkled them with sugar. I used to help my mom when she would make them, but ever since she passed away, the torch has been passed on to my daughter and I. 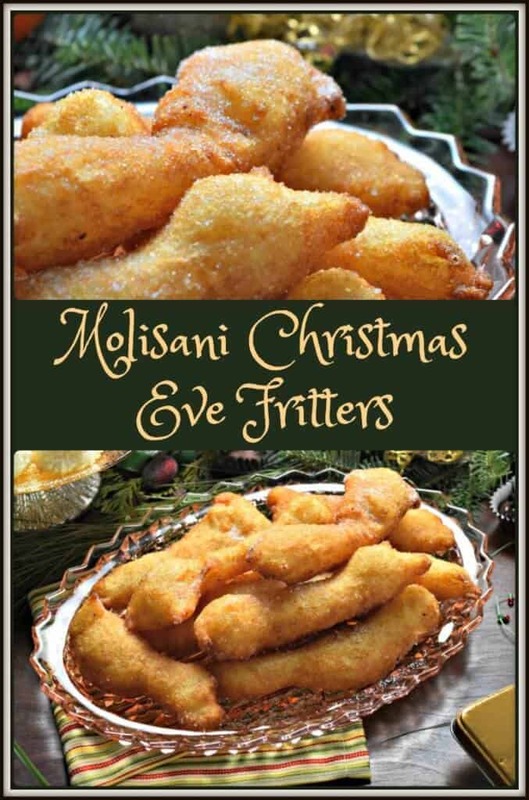 Ever since I can remember, these Traditional Molisani Christmas Eve Fritters would be made on the morning of Christmas Eve Day. In the dialect of my paternal grandmother, we would refer to them as scr’pell -which would be spelled as screppelle. Needless to say, this is an old family recipe with its origins from Ripabottoni, in the province of Campobasso, in the Italian region of Molise. The dough would be made in the early morning hours and fried in batches just in time for lunch, which consisted of this Saint Joseph’s Day Spaghetti Recipe (made twice in the year; once for Christmas Eve lunch and once on March 19th) and baccala (salt cod) with potatoes. These screppele would be part of the Christmas dessert line-up, along with an endless assortment of cakes and cookies. I can still envision my paternal grandmother and my mom making this yearly treat. My grandmother would be the one meticulously shaping and dropping the dough in the hot oil; my mom was responsible for making sure they were fried to a golden perfection. You will probably find all shapes and sizes when it comes to these fritters; and today there are all kinds of variations. 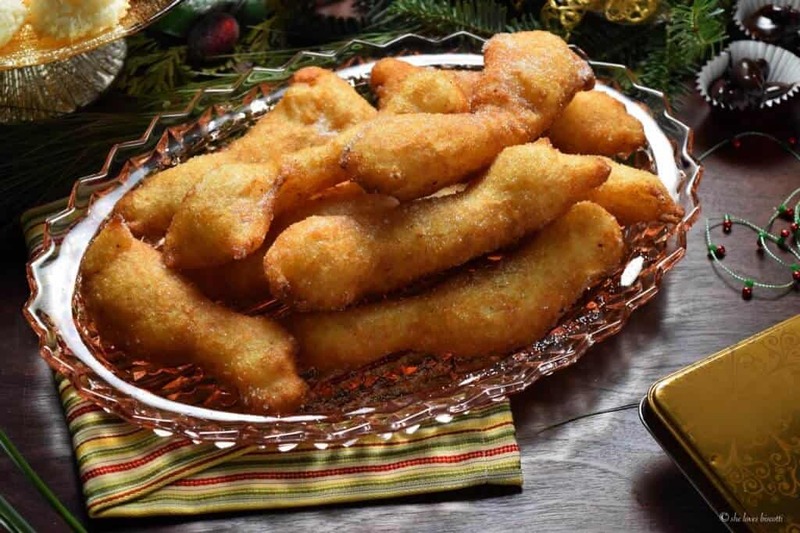 The recipe I am sharing with you today is the one that I grew up with – a simple potato yeast fritter, shaped into a 4-5 inch log-like shape. After my grandmother passed away, the lead was taken by my mom. When I was not working, I would be the official helper, otherwise, this role was assumed (somewhat clumsily) by my Dad. The tradition continues; now I take charge with this recipe, helped by my daughter. It never ceases to amaze me how certain foods have the power to bring us back in time and elicit so many wonderful memories. For my dear family, friends and all of you that are celebrating Christmas, I would like to wish you and your loved ones a very Merry Christmas. And for those not celebrating Christmas, I hope the weekend is full of love, happiness and some wonderful moments! Keeping some wonderful childhood memories alive with this recipe for scr'pell ... Traditional Molisani Christmas Eve Fritters. Meanwhile, in the bowl of a stand mixer, combine the flour, salt, mashed potato, and water with the dough hook. Add the yeast mixture and knead for about 10 minutes. Please note that the dough will be extremely soft. Cover and allow to double in size. This will take about 2 hours. Stretch a piece of dough about the size of a golf ball and drop it in the oil. When they achieve a light golden color, remove them from the oil, and place on the plate lined with paper towels. This should take 1-2 minutes. Repeat until there is no dough left. These fritters are best the day they are fried. The consistency of the dough should be lighter than pizza dough. Rub finger tips lightly with oil when picking up a portion of the dough to be fried. Hello, and thanks for this wonderful easy to prepare recipe. Taste heavenly. Wanted to ask you if you could use this type of dough to make a pizza. Or is the dough to soft to prepare it with this recipe. I just love this dough with the potatoe in it. At christmas i made them several times. Thank you, brought back memories. My pleasure Josee! I am so happy you enjoyed this recipe. That is such a genius idea Josee! You know I have never tried it… but I am thinking it just might work… I would probably add a little more flour to get more structure in the dough. I’m working on a couple of recipes right now for Easter… but I will definitely give it a try. If you try before me, I would love to hear about your results. Thanks so much for taking the time to share your experience with this screppelle recipe, appreciate it! I made this for the first time since my mother passed away.I used to always help my mother as you need two people . I never made the dough as it was already to go by the time I went to help my mother. I would eat a bunch as we fried them. Well they turned out excellent for my first time and my brothers said “they are as good as moms”. The only thing is that they were not enough , we were 12 people but everyone was eating around 3 or 4. I am making them again tomorrow for my brothers birthday, why wait for only Christmas. Can the recipe just be doubled? Thanks a million for the recipe. I am so happy to hear this ♥ Yes, in fact my mom and grandmother would make a huge batch of these screppelle. I think you can double up on the recipe without any problems as you know the consistency of the dough. Just in case, you can always adjust to that consistency either by adding more water or flour. Thanks for taking the time to share your experience with this recipe, appreciate it! I was happy to see a potato yeast dough! My mother made them Christmas Eve but put a whole anchovie fillet in the middle and my youngest son just loved them! He still loves anchovies and do you think that I could try this dough for a savoury application? There is only a minute amount of sugar to proof yeast, so the dough itself would not be sweet! Thank you for bringing this very special recipe wrapped in family history to all of your readers. Although I am familiar with many of the fried treats we Italians celebrate with, I had never heard of Screppelle. Potato adds a lightness to any dough and this particular batter must produce feather like pieces of heavenly goodness. I thought that my frying for 2016 was over, but perhaps not. Happy New Year to you and your family Maria, I look forward to traveling the culinary road with you in 2017. Had a smile when I read you blog. My parents are both from Campobaaso and just last night while celebrating Christms Eve with my family. My brother and I were talking to my mom ablout, when she used to make as fritters for Christmas Eve and in February for Carinaival week. Will share this recipe with my mom and brother. I love this story! How wonderful that you and your daughter are carrying on this tradition. I also wish you and your family Happy Holidays!!! I just finished frying some Zepolle. They were a delicious Christmas Eve tradition. I had never made them myself. I only watched my how they were made. As I was mixing the dough I wished I had written down the proper proportions of potato and flour. Then when I opened my email: There was your blog for Christmas Eve fritters. THANK YOU! 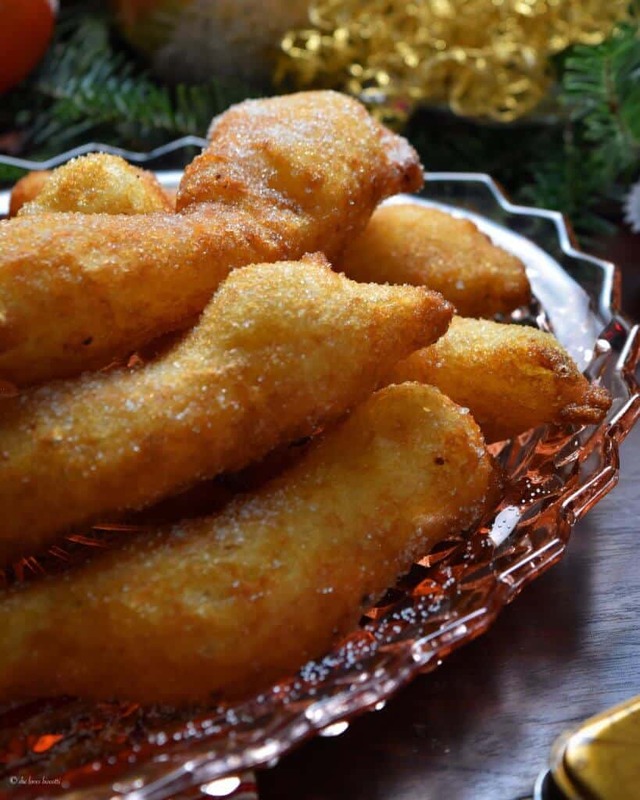 Your recipe will now be my new traditional recipe as both my children (adults now) grew up eating the zepolle at Christmas and always ask me to make them. Wow you are a ‘molisana’ just like me. I’m born and raised inOntario but parents from molise region. This recipe is how my mother makes the screpelle on Christmas Eve. Yes with potatoes. We sprinkle them with sugar while they’re hotand keep eating them as they are addictive. Love your blog and keep the recipes coming.